Today is our eighth snow day of the school year! I find it funny that we originally had today off, but after our first few snow days the administration made today a school day again. Unfortunately for them, it snowed yesterday and last night, so today got re-cancelled. I personally really like snow, but I have to admit that this routine is getting a little old. Plus, senior year will be over in the blink of an eye! I’d like to be able to enjoy going to school while I can (do not fear- I’m not one of those people who adores going to school every day, but I do generally like my classes and I enjoy seeing friends rather than being snowed at home with only homework to do). While baking is a nice thing to do on a snow day, I’ve been craving fresher foods reminiscent of spring and summer. 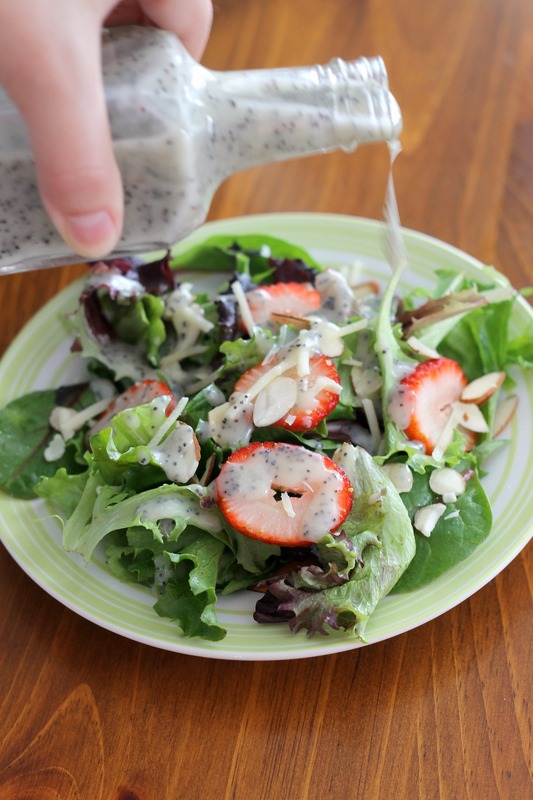 A lightened-up poppy seed dressing on a strawberry salad with almonds and Parmesan? Perfect! This dressing takes under 10 minutes to prepare and is delicious. It doesn’t rely on mayonnaise or any of that kind of thing for creaminess. You slowly drizzle in oil to make an emulsion, which renders the dressing perfectly creamy. The dressing perfectly complements the strawberries, the Parmesan adds a kick of flavor, and the almonds add crunch. Maybe I’ll make this for a school lunch someday this week! I’m terrible about packing good lunches- at 6 in the morning I have no interest to get up to make anything, and the night before I’m usually up late doing homework. But this super-quick salad might change that. Oh, and Happy Valentine’s Day! Using a blender, small food processor, or immersion blender, process together the onion, mustard powder, salt, sugar, honey, and vinegar until completely smooth, about 15 seconds. Slowly stream in the oil with the blender running until the dressing is creamy. Stir in the poppy seeds. Top lettuce with almonds, strawberries, and grated Parmesan. Pour over desired amount of dressing and serve. Enjoy! 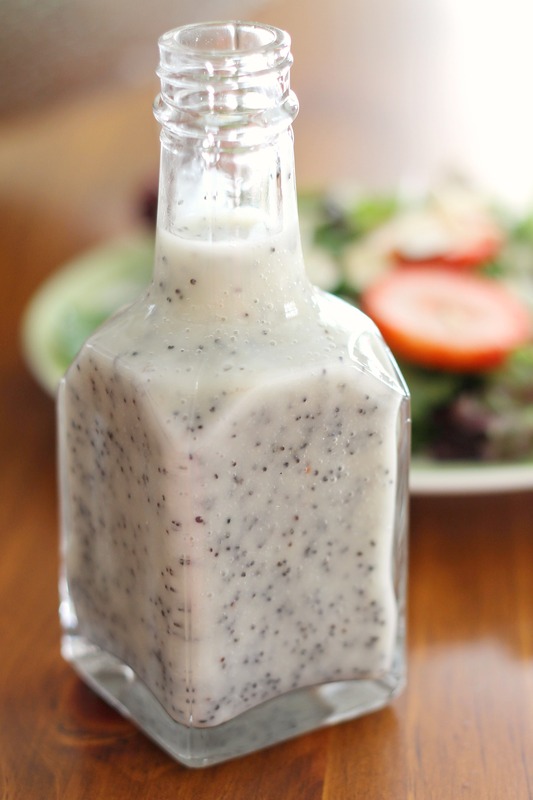 Loved reading your blog on the poppy salad dressing! Keep up the good work to make the world more delicious! Thanks! Glad you enjoyed reading this! So glad you like the pictures! I hope you try this salad and love it as much as we do. Thanks for stopping by!